Whilst in Rome, we visited everywhere by foot, meaning that although there was a lot of walking involved, we got to really soak up the culture and see things that we may not necessarily have done if we had travelled on the metro to get about. Although saying this, I think my feet and calves would have thanked me a lot more if we had chosen the metro option instead..
Rome is literally any Instagrammer's dream, as much as I hate to use that description. Every single building you pass or side street you walk down holds so much history and the architecture is beautiful, from the colours of the buildings to the worn down cobbled pavings. I went a little photo-crazy whilst I was there and couldn't help but snap photos of virtually every building we passed. I will be completely honest in admitting that all of the 'tourist attractions' that we did see, we simply found by getting lost. On our second day in Rome, we accidentally stumbled upon the Colosseum. , which was as the top of our list of places to visit. Being the typical tourists that we were, whilst trying to make some sort of sense out of our map, we glanced up momentarily and at the end of the side street we were on and we could see the Colosseum in all its glory in the distance. It really was something. The side streets that led to it were also full of interesting shops, some of my favourites that I found whilst exploring Rome. These included gelateries, vintage clothing stores and healthy smoothie shops. 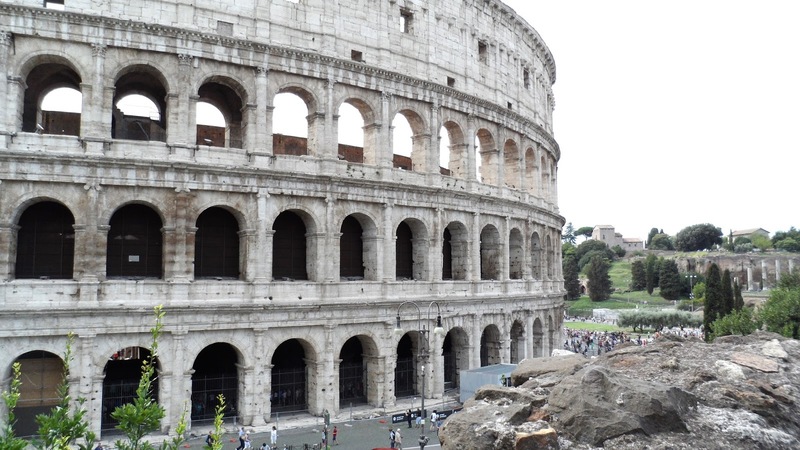 Before travelling to Rome, we pre-booked tickets for the Colosseum, which also covered the Roman Forum and Palatine Hill. The cost of each ticket was €12.00, which allowed us both to go into the fast track section when queuing. This is especially helpful if you are only planning on visiting Rome for a few days, as ultimately, the time spent queuing could be spent exploring another tourist attraction. We ended up paying for our tickets on the Co Op Culture website and printed these out before we visited. 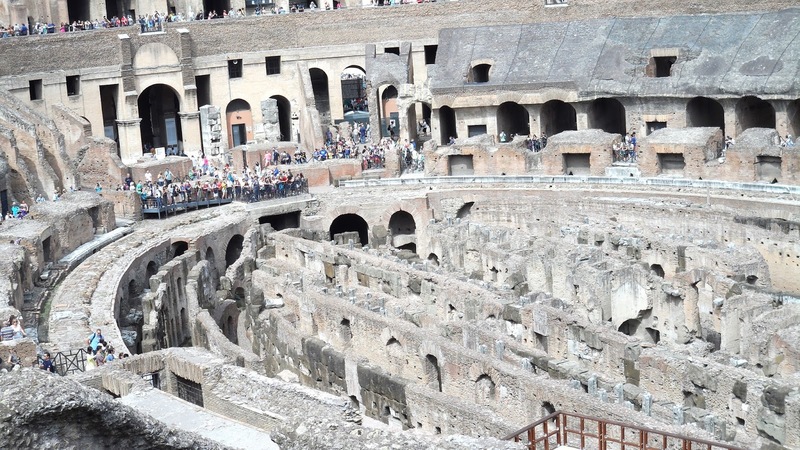 I was so relieved when we were inside the Colosseum; as with any typical tourist attraction, you get a serious number of pick-pockets lingering around the queues. We saw several pick-pockets whilst we were waiting and we even saw a man run off with a seller's bag full of water bottles, following by lots of shouting coming from the crowd. The tour guide next to us whilst we were queuing explained to tourists that it was nothing to be scared of and that it happens all of the time. 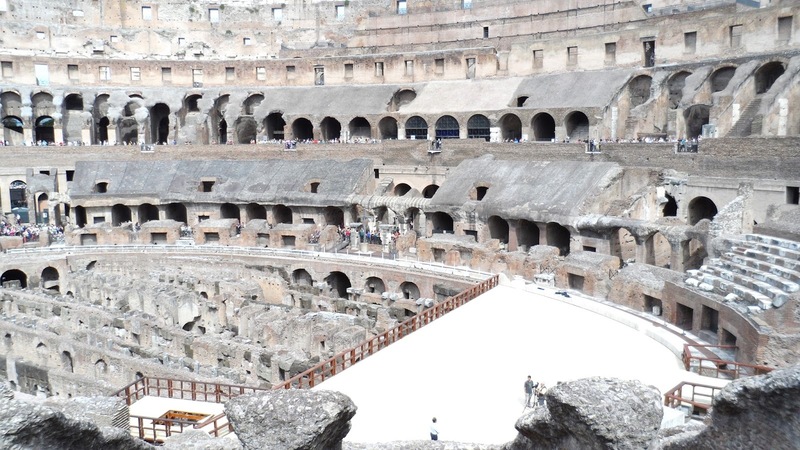 Once we were inside the Colosseum, we felt far more comfortable but still kept our bags/cameras close to us. Most people visiting the Colosseum will know the history to the venue before visiting, however, I would strongly recommend paying for a tour guide to show you around. Whilst we were inside, I wished that we had booked to go on a tour to get even more out of our visit and to get a better understanding of the events that would have happened in each part of the Colosseum. There are still English translations on all signage and beneath any artefacts on show in glass casing, however. Once inside, we spent around an hour looking around but you could easily spend twice this time looking around. I would also recommend going quite early in the day if possible; we arrived at around 1pm and by this point, it was fairly crowded inside. Just to get to the railings inside to get some good photos was a real struggle, especially whilst battling through the numerous selfie sticks poking out in all directions. It really is quite difficult to imagine the scale of the building without visiting and no photos will ever do it justice. I also don't think I will ever be able to get my head around the fact that this was built such a long time ago and still stands so triumphantly to this day.